The idea that your deck is just a place for a few chairs and a grill is a thing of the past. This year has already seen a number of new and innovative concepts for deck construction that will make your deck seem like the best room in (or out of) the house! From new materials to expanding your entertainment system, there are tons of new projects and ideas to enhance and expand your deck. Here are a few of our favorite concepts that we’ve seen this year. ● Weatherproofing: Wooden decks are classic and can seem cheaper when you’re doing immediate accounting, but through the rain, wind and beating sun, of San Diego every year, wood can start to break down fairly quickly. 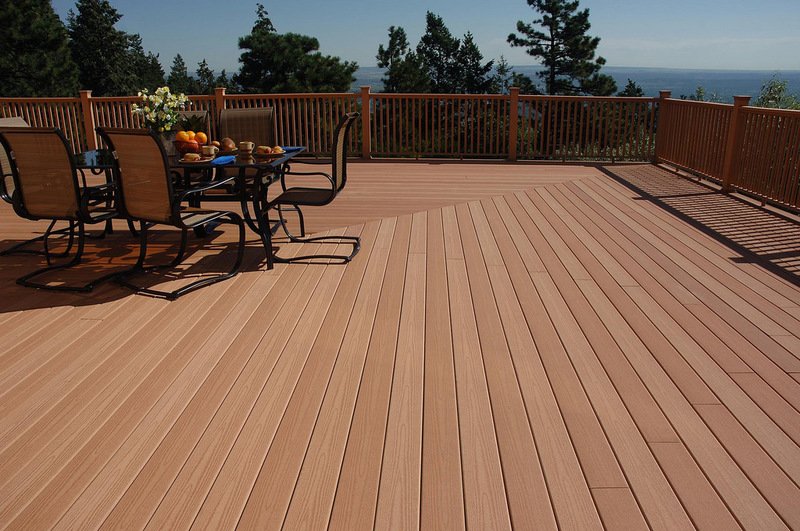 Instead of using wood products, consider alternative materials such as PVC or composite decking if you’re trying to be a little more environmentally friendly. Different materials might seem like a big initial investment, but your pocketbook will thank you later. ● Bigger Is Better: Decks are for enjoying the weather with friends and family, and the more the merrier, so make sure that your deck is big enough to accommodate. Interest in larger, more spacious decks has risen recently, and people are using that newfound space for spas, extra seating and furniture, countertops and surface area for the grill, and even entertainment systems. More space means a more comfortable environment for your guests when entertaining, more versatility and more options for enhancing your deck whenever the next great project idea strikes you. ● Multimedia Entertainment: These days with technological development and the dropping prices for entertainment electronics, you don’t have to pick between watching the football game on Sunday afternoon and enjoying the beautiful San Diego weather of an early fall day at the same time! Waterproofing and weather protecting technology are available to set up and protect a television and speaker system for your deck all year round. With the television outside, you won’t have to constantly run back and forth to check the grill during commercial breaks! ● Colors And Designs: Conventional brown wooden decks certainly are charming, but personalizing your deck to match your home is important. Painting the railing or investing in different structural materials can create a seamless and aesthetically pleasing match to the color and style of your home. Grey decks or two-toned woods are both on the rise in popularity right now, as well. Every home is different, so why not personalize your deck to reflect your unique domicile. ● Extending the Season: Only being able to enjoy your deck during the warmer months is limiting, so why not extend the season with temperature control. Chimineas and fire bowls are classic options, but sitting right next to a fire doesn’t leave much room for accessibility. Built-in fireplaces can run on a gas line or wood just like indoor fireplaces, and provide a unique and cozy look to any deck. Space heaters and warming mats are also affordable and mobile options for easy storage after the snows melt. These are just some of the newest trends to check out when styling the deck on your new San Diego home. For more in the latest trends inSan Diego home decor, make sure to subscribe to our blog!